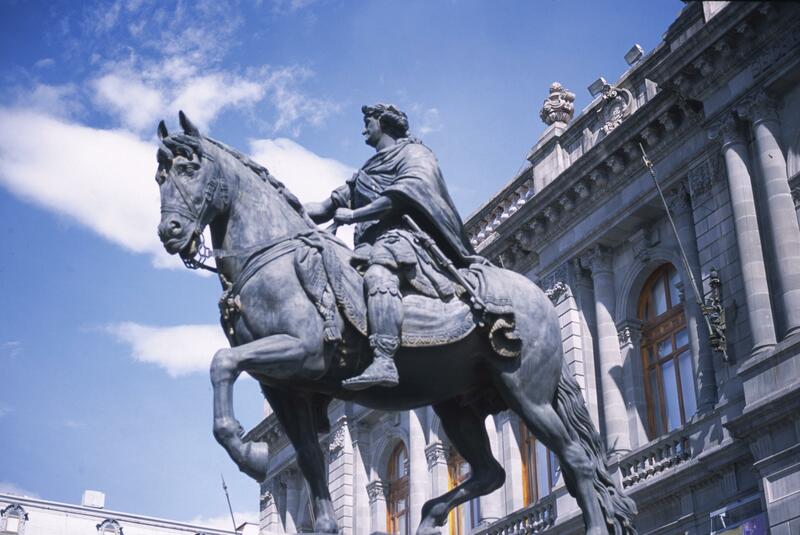 This statue of Charles IV, popularly known as “El Caballito” (“The Little Horse”), was erected in Mexico City to celebrate the king during an era of waning monarchial power. Equestrian statues are difficult to sculpt and cast, as a mass of metal has to balance easily along the three points of the horse’s feet. On this one, Charles IV appears dressed in the military garb of a Roman emperor, and evokes a famous statue of Marcus Aurelius in Rome. The sculptor, Manuel Tolsá, thus connected the Spanish empire with that of the ancient Romans. This bronze statue replaced an earlier model created of wood and plaster. The Viceroy of New Spain, the Marqués de Branciforte, proposed this statue as an indication of the loyalty of the American colonists to their king in the wake of both the French and American Revolutions. He covered costs with a public subscription and the first statue was erected with great fanfare in 1796. The Viceroy who commissioned this sculpture, the Marqués de Branciforte, wanted quick results, and had an equivalent sculpture made of wood and plaster erected in 1796. The bronze casting of Tolsá’s work took time and this, the final sculpture, was completed only in 1803. This famous sculpture, well known to Mexico City residents then and now, was sponsored by the Viceroy to reignite the loyalty of the colonists for their King. The celebrations for its inauguration, which coincided with the birthday of the Queen, were another means of producing loyalist feelings. But for many, the celebrations had little lasting effect and battles for independence would break out in Spanish America within two decades of the statue’s initial dedication. Bargellini, Clara. 1987. 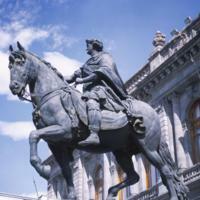 “La Lealtad Americana: El significado de la estatua ecuestre de Carlos IV.” In Iconología y sociedad: Arte colonial hispanoamericano. XLIV Congreso Internacional de Americanistas. Mexico City: Universidad Nacional Autónoma de México, 207-220. Bargellini, Clara. 1990. “View of the Plaza Mayor Mexico City.” In Mexico: Splendors of Thirty Centuries. New York: Metropolitan Museum of Art, 489-490. Niell, Paul and Stacie Widdifield, eds. 2013. Buen Gusto and Classicism in the Visual Culture of Latin America, 1780-1910. Albuquerque: University of New Mexico Press. Pinoncelly, Salvador. 1998. Manuel Tolsá, arquitecto. Mexico City: Consejo Nacional para la Cultura y las Artes.